Set amongst tranquil gardens, waterways, exclusive pools and Madinat Jumeirah’s private beach, the intimate and exquisite summerhouses of Jumeirah Dar Al Masyaf offer newly refurbished elegant and spacious guestrooms and courtyards, personalised and generous butler service and an understated Arabian luxury experience. These summerhouses offer an exquisitely designed hideaway – the premium accommodation at the Arabian Resort of Dubai.Every summerhouse has a typical Arabian Majlis or living room where sundowners are served to guests daily before they depart by traditional abra boats, on foot or by golf buggies to one of the resort’s 40 restaurants. Jumeirah Dar Al Masyaf has been completely redecorated in summer 2015 and features Arabian, Gulf and Ocean villas.Dubai’s longest private beach is only steps away, as well as the many facilities within Madinat Jumeirah Resort. 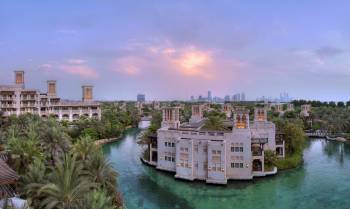 Souk Madinat Jumeirah features more than 80 shops, bars and restaurants. Access to Talise Spa and Talise Fitness, tennis and squash courts as well as unlimited access to Wild Wadi Waterpark™ are all available to guests. Madinat Jumeirah is a resort built on inspiration. A self-contained sanctuary of Arabian elegance, this is a destination that will linger in the memory of your guests.With Fort Island, Madinat Jumeirah, the Arabian Resort of Dubai, offers the largest hotel event space in the United Arab Emirates. This exceptional outdoor venue has the capacity for large marquees and can accommodate a plethora of events including festivals, weddings, banquets, exhibitions, product launches, parties, and music concerts. Set along a beautiful beach, Madinat Jumeirah includes two grand boutique hotels, traditional summer houses, a conference hall, a multi-purpose venue, an outdoor amphitheatre, indoor auditorium and the world class Talise Spa. At the heart of the resort experience is Souk Madinat Jumeirah, a vibrant retail, leisure and dining experience.